Over at F1 Fanatic there has been some debate over Fernando Alonso's apparent complaints against the McLaren team. There are the usual arguments for and against and I haven't contributed, mainly because I think Keith said just about everything in his article. Being me, however, I can't resist saying something, so I offer this brilliant YouTube video as good advice for Fernando; in fact, I really think it should be renamed Alonso's Blues. That's some mean harmonica playing too, for those who enjoy that sort of thing. While all the fuss about Alonso erupts at F1 Fanatic, a suitably quieter little discussion has been going on at Ollie White's Blog F1 on the subject of Kimi Raikkonen. It begins as a realization that Kimi shows signs of becoming the 21st Century's Stirling Moss but then reverts to the usual consideration of Kimi's character. And I think that "the Alonso Affair" demonstrates why we should have a lot more respect for the Raikkonen approach than we do. We can't have it both ways, after all, and it is unfair to berate Alonso for venting his feelings and then to dislike Kimi because he doesn't. If we have to consider character as part of our assessment of a driver (and I admit it's a huge factor in my assessment of Michael Schumacher), then we should be consistent at least. It should be obvious that Kimi is handling his team mate situation much better than is Alonso. He has just as much cause for complaint in that he is paired with a driver who is proving much quicker than he was supposed to be, but Kimi shows absolutely no sign of being discomfited by that fact. Not once has he mumbled something about unfair treatment or favoritism; he just tells us the bare facts in his Finnish monotone, then gets in the car and drives. 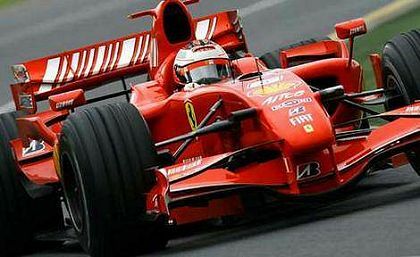 I have been pleasantly surprised by how well Kimi has conducted himself in the Ferrari camp. At times he has been under severe pressure from the press to say something, anything, to indicate at least a little dissatisfaction, but he has not been drawn. And I don't think it has anything to do with an awareness that Ferrari would not put up with the kind of thing McLaren is having to deal with from Alonso; it is just that Kimi keeps himself to himself. There are ego issues too. Much of Alonso's frustration comes from his perception of himself as the best driver in F1 - hence the grumbles about how much he puts into development of the car with no apparent favor in return. But Kimi races because he likes racing and, as a result, he has a Moss-like attitude to being beaten: just wait until next time, then we'll see. Which brings us back to Stirling Moss. If ever a driver were treading in Stirling's footsteps, it is Kimi. There is the same unspoken recognition from most that he is the fastest, the same shaking of heads over his abominable luck, the same expectation that he will suddenly break through and become unbeatable. The reasons why that breakthrough never happens may be dfferent in each case, but it looks likely that Kimi too will fail to reach the ultimate goal of the championship. Their characters are very different as well. Stirling is charming, enthusiastic and well spoken; Kimi is monosyllabic. Yet they deserve our respect for the same reason: neither complains about circumstances, luck or machinery. And that is my point - that we should respect Kimi for his silence, rather than criticize him for not allowing us to see the real Raikkonen. In a time when the new man is expected to burst into tears at the drop of a hat and be comfortable with his emotions, Kimi reminds us that other ages have seen silence as a sign of strength. I like the guy and his deadpan demeanor - the Iceman doesn't crack. 12 races and only a point between them. Does it get any better? The article was about Kimi but consider Massa has played the same role, silence and courteous behavior. One of the best parts of this year has been placing stereotypes based on Nationality. Kibica/Hiedlfeld - (I'll group them together) The efficient and results driven. We should be thanking both Raikkonen and Alonso as the two leading drivers prepared to admit openly that (barring mishaps) a driver’s position coming out of the first corner pretty well establishes his position at race end. Admittedly Raikkonen is the most convincing of the two, because he genuinely looks bored on the podium. Since their podium audience is counted in the tens of millions worldwide, the FIA will either have to stifle them (for which I’m sure Max has an applicable rule ... although given the current rule-book’s size, it may take some time to find) or actually do something constructive about this condition. If I may respond to Number 38’s post? As a very young man I watched Sterling Moss compete in the Lady Wigram Trophy races at Christchurch, N.Z. My impression that has endured over the interim? He was fast ... very fast! However, he seemed to be running a personal contest with the car: How many laps will it take for me to destroy this machine? While there have been murmurs of Raikkonen being a little hard on the car, he’s a long, long way from being competition for Moss in that regard. Yes, Kimi’s F1 career to date does resemble that of Sterling’s. Whatever the reason, I very much hope it doesn’t finish that way. It's certainly true that, thanks to the honesty of Raikkonen and Alonso, we get to see more of the inner workings of F1 than would otherwise be the case. No doubt the FIA don't like that, since it reflects on their rules, and if it gets too bad I suppose they could always fall back on the "bringing the sport into disrepute" rule. It might be a little harder to slap down the two top drivers than it was to deal with Coulthard, however. It seems you're both in agreement on Stirling's treatment of his cars. To be honest, I've never thought that much about it but you could be right. In those days cars were pretty fragile anyway so even a small amount of abuse could be enough to break them. It's a terrible thought - that Stirling might have been the architect of his apparent bad luck. Kimi is not overtly hard on his cars so I'm not sure that I agree with those who accuse him of it. And I hope, like you, that he will defeat his luck in the end and win the championship. The only time I've seen Stirling Moss was at the historic F1 race supporting the 2002 British GP qualifying. It was quite frenetic, but I soon noticed that Stirling Moss was getting an advantage by using the old configuration of Club corner. This struck me as a bit odd... ...until the red flag came out. After everyone had sauntered in (and Stirling did not ignore the flag on this occasion!) it was explained that Stirling, unlike everyone else, was following the correct configuration. It probably won't surprise you to hear that Stirling went on to win after that little incident. As for Mr Raikkonen, it's good to have different people in the championship, rather than just the stereotypical faceless drivers that seem to be in vogue at the moment. Kimi was near the front of that queue, but has moved on to be his own man. It would take Article 151c to slap down he and Alonso on the podium, since bored looks do not actually disrupt proceedings. Besides, there are so many drivers up there who don't look happy, and it's been the case for so long, that the FIA would have considerable difficulty enforcing a "mandatory smiles on podium" rule.